Mayor Charlie Hales of Portland: Tell Sister City, Ulsan, South Korea, That We’re Opposed to the Torture and Consumption of Dogs and Cats. Ulsan became Sister city with Portland in 1987. Ulsan is one of the largest dog meat consumption areas in South Korea. If you have ever wondered what hell would be like, just visit dog slaughterhouses, markets and restaurants scattered all throughout Ulsan. 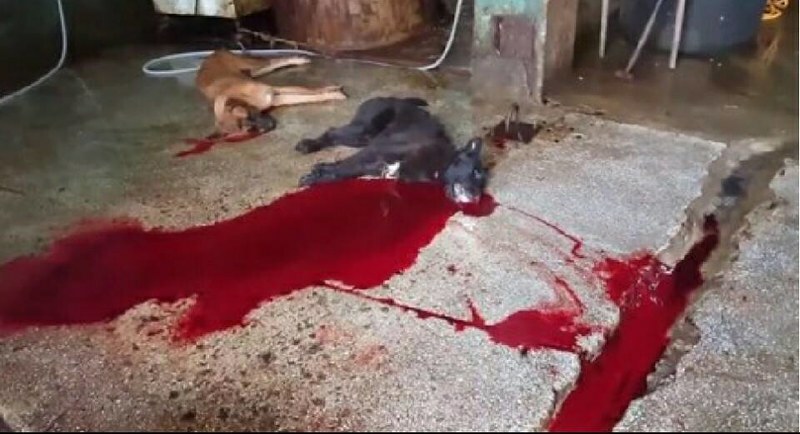 There are countless dog slaughterhouses, markets and restaurants where the dogs, who are tortured their entire lives, end up being slaughtered in the most inhumane ways, such as by electrocution, hanging or beating; and then thrown into boiling water – sometimes while they are still alive. In many places, dogs are being killed in full view of other terrified, caged dogs; and this takes place in public and in broad daylight. In addition, many abandoned and stolen former pets end up in this industry, and are subjected to the same cruelty. 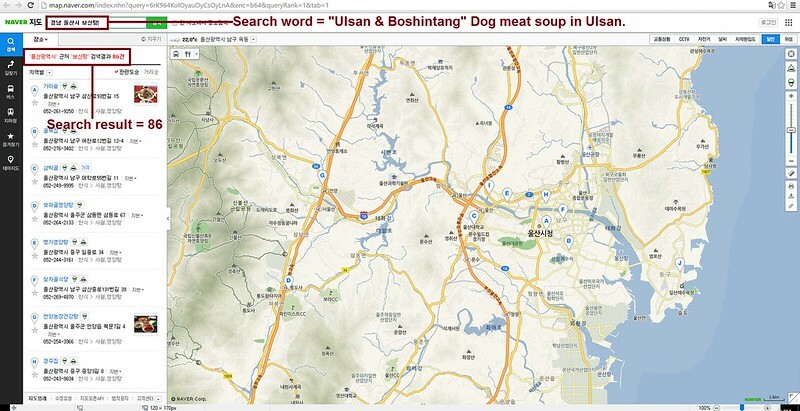 A Search Engine reveals the sickening scale of Ulsan’s dog meat demand. The searches resulted in: 200 Health Food Centers; and 86 restaurants in and around the city of Ulsan alone. Even if half of these ‘Health’ Food Centers and restaurants serve dog and cat ‘ingredients’ in one form or another, just imagine how many dog/cat farms and slaughterhouses must be present in and around Ulsan in order to supply all of these outlets. Please sign petition, call and email Portland Mayor Charlie Hales, TODAY! Ulsan is one of the largest dog meat consumption areas in South Korea. 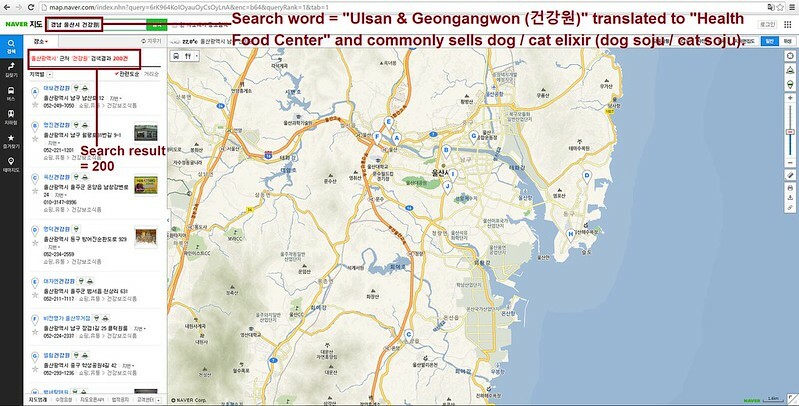 The Korean internet searches resulted in: 200 Health Food Centers which commonly sell dog/cat elixirs (also known as dog soju and cat soju); and 86 dog meat soup restaurants in and around the city of Ulsan alone. No matter where you live PLEASE SHARE these actions with your friends – especially those who live in Portland! I have sent the emails with the message you provided as well as a personal message too. I have Facebooked a message to the Mayor and I have copied the number to call this week. I also have the address to send a copy of the letter to Mayor Gi-Hyeon Kim. Thank you. Over the years I have signed many many petitions on the subject from these eastern countries who seem to have no care of these poor animals suffering,ever since that first time I saw on tv about 1998 when one of our sportsman was in China and went down a wrong turning and discovered these slaughter houses and dogs and cats for sale in cages outside.I think it was when China wanted to hold the Olympics there,he brought back to England this horror of what is happening.It shows that some countries can hide what is happening if they want foreigners not to see.I hate the thought of these poor innocent animals being bred for meals for the insane public out there.Thank God that most Chinese and eatern countries have joined the fight to save the animals.Hopefully when the barbaric ones die and the butchers die that the ones after that will appreciate animals not for food,there are many animals stolen for the barbaric trade.Its heartbreaking.If their was a God who cared he would wipe the evil ones from the earth like Sodom and Gomorrah.But i think if their is a God we have to act for the good of others for him,like he is not intervening.I wish I could make all animals life better and stop a lot of crap happening to them and Children and other vulnerable humans. Please stop this cruel tortour???? stop torturom,to wstyd dla Chin co robią z tymi biednymi zwierzętami.STOP YULIN FOREVER THEY WILL NEVER SILENCE US!!!!!!!!!!!!!! The hideous butchers responsible for these atrocious acts should be put behind bars! If Koreans believe that a tortured dog is “healthy” to eat, maybe it is even more healthy to torture and eat the humans committing those brutal acts of violence! WHY NOT! Apparently, Koreans WILL EAT ANYTHING! I cannot believe that I was drafted into the US Army and put in harm’s way to ‘save’ such a despicable country. These horrifically cruel,vile,appalling and disgusting stories of the slaughter of innocent animals makes me sick and mad as hell. This insanity must stop and stop now and we must all take a stand to make that happen. Boycott these countries, make them enforce the laws and stop these monsters who are doing this to living breathing innocent animals. It is one thing to have to eat something BUT HOW you slaughter these animals in the most cruel,painful way is just deplorable and it must stop!!! We all will be held accountable for what we have done in our life on this planet and these monsters who are involved in these slaughters better get prepared. I’ve signed many, many petitions against the dog meat trade in Korea, China, Vietnam, Thailand, and Cambodia to name just the top five. It’s hard, but I go out of my way NOT to buy products from these countries, or eat their food any longer. Will I ever buy a |Hyundai car? Hell NO! No hear for the defenseless. Is barbaric, and beyond cruel and disgusting. It’s ip to their government to get it together. Do you want your country to be known as cat and dog killers, and to top it off, you eat them. That is gross!! !there are other thing to eat besides killing dogs and cats. There are fruits, vegetables, a vegan diet. No animal by products. Leave the animals alone. These people are not human, just wicked, barbaric pieces of living skin . i send them all a email , just a short message not the letter. i did that the last time that there was a action of this. so they know everyone is against this hell! I got a response back. One of the council members says that while she is ‘compassionate’, she sees no reason to end relations. Her reasoning is over paid sick leave. Stop these bloody atrocities you are not human you are brutal evil vile cruel Demond’s not fit to be part of this earth cruel evil vil sum.all signed . disgusting behaviour…this is mans best friend. be humane lift your game. love animals, don’t eat them. I did get a reply myself and the minister was quite astonished and said she will do all she can to get Korean minister to change laws.